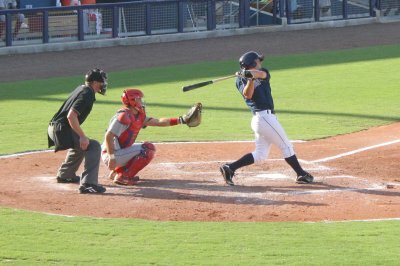 The Charlotte Stone Crabs lost their fifth game in a row, falling to Palm Beach 6-1 on Monday at Charlotte Sports Park. With the loss, the Stone Crabs have to get a win during the second half of the season. Palm Beach took the lead in the first inning. Tommy Pham drew a walk then later scored on a double by Chris Swauger to take the lead 1-0. A walk to Colt Sedbrook led to the start of another Cardinal rally in the fifth. Sedbrook scored on an RBI single by Tommy Pham. Pham then scored on a wild pitch to increase the lead to 3-0. The Palm Beach offense continued to roll, striking for three more runs in the seventh inning. Swauger was hit by a pitch. Jermaine Curtis followed with a single to left. Charles Cutler then drew a walk to load the bases. Xavier Scruggs drove home all the runners with a triple to center to take a commanding 6-0 lead. The Stone Crabs picked up a run in the bottom of the seventh to avoid being shut-out. Greg Sexton was hit by a pitch to put a runner on. Sexton advanced to second on a ground out by Michael Sheridan. Anthony Scelfo plated the run with a single to center. But the Stone Crabs could not push across another run, taking a 6-1 loss. Chris Andujar suffered the loss, pitching 5 innings and allowing 3 runs on 5 hits with 3 strikeouts and 3 walks. Marquis Fleming pitched 2 innings, allowing 3 runs on 2 hits with 3 strikeouts and 2 walks. Neil Schenk and Michael Jarman continues to dominate out of the pen, leaving the Cardinal offense hitless in the final frames. Schenk pitched a no-hit eighth inning with 2 strikeouts and a walk. Jarman was on in the ninth, allowing no hits as well. The series heads to Roger Dean Stadium for the final two games. Joe Cruz (4-5, 4.30) will face Arquimedes Nieto (6-3, 4.04).